Fill your stomachs this week with classic comfort food presented in uniquely delicious ways. Grab a bite of vegan hot dogs at Grand Hyatt Singapore's Beyond Sausage hot dog truck, or indulge in the never-disappointing flavor of black truffle with Senso Ristorante & Bar's new Winter Black Truffle menu. Still haven't figured out where to brunch this weekend? SKAI's new bottomless champagne and cocktail brunch is one with a view to boot too. Expanding its plant-based menu, Grand Hyatt Singapore introduces Beyond Sausage! A non-GMO gluten-free and soy-free sausage made of peas, fava beans, rice, beet, and coconut oil, it contains more protein and less fat than traditional sausages, making it a truly healthier and tasty alternative for vegans and non-vegans alike. Catch the launch of Beyond Sausage at Grand Hyatt Singapore's Hot Dog Truck from 17 to 19 January 2019 at just $8 nett. Otherwise, it'll be available on the a la carte lunch and dinner menu (served with French fries and dressed cabbage salad) at Oasis from 21 January 2019 for $18++. Beyond Sausage Hot Dog Truck is located at Grand Hyatt Singapore Hotel Driveway, 10 Scotts Road, Singapore 228211, p.+65 6738 1234. Open from 17-19 January, 12pm - 9pm. This January, Senso Ristorante & Bar presents a selection of dishes that highlight the ever decadent black truffle. Available until the end of March, the special menu features the likes of Angus Beef Tartare with shaved Black Truffle Salad ($42) and Homemade Taglierini Pasta with Black Truffle ($58). Black truffle is also incorporated into dessert in the Ile Flottante ($28) - a combination of soft meringue, vanilla cream, macadamia, and caramel. For a complete epicurean experience, diners can also opt for the three-, four- or five-course meals (additional wine pairing available) from 17 January 2019 to March 2019, starting at $112++ per person. Senso Ristorante & Bar is located at 21 Club Street, Singapore 069410, p.+65 6224 3534. Open for lunch Mon-Fri 12pm - 2.30pm, Sun 11.30am - 3pm and dinner daily from 6pm - 10.30pm. Closed on Saturdays for lunch. Everyone's favourite Japanese retailer, Don Don Donki, has now opened it's largest outlet to date at City Square Mall. Along with a more extensive range of signature Japanese offerings and exclusive bargain section, the new outlet also introduces a Japanese food court. Housing five different stores, customers can expect an eclectic selection of Japanese cuisine, including the famed Shio Ramen ($12.50) from the famous Hokkaido Ramen Santouka, Hokkaido Creme Brulee Soft Serve ($8) from Naganuma Ice no-ie, melt-in-your-mouth Wagyu Beef Steak-Ju Bento with Grilled A5 Wagyu Beef Steak Set ($29) from Yakiniku Heijoen, quality Chopped Unagi Bowl ($13.80) from Bonta Bonta, and mouth-watering fried chicken from Rang Mang Shokudo's Rang Mang Special Set ($17.80). Don Don Donki City Square Mall Food Court is located at City Square Mall Basement 2, 180 Kitchener Road Singapore 208539. Open daily 10am - 10pm. Recognised as one of Latin America's 50 Best Restaurants in 2018, restaurant Osaka is making its first collaboration appearance in Asia and Singapore at NAMI Restaurant & Bar. Happening 21-27 January 2019, the week-long pop-up will showcase the harmonious amalgamation of two cultures - Japanese and Peruvian - in a 7-course "Nikkei Experience" dinner tasting menu priced at $188++ per person. Expect delights such as Chirashi Black Causa, a King Crab tartare, with pearls of ikura atop Peruvian mashed potato, the Tako Anticucho - charcoal grilled octopus with a Nikkei Chimichurri sauce. For dessert, Suspiro Perú, a combination of soursop sorbet with lemongrass dulce de leche and Amazonian chocolate crumbs. To top it off, there'll be five Peruvian-inspired cocktails ($24++ each) crafted by Adam Bursik, Bar Manager of Origin. The Osaka Cocina Nikkei Pop-Up will be held at NAMI Restaurant & Bar, Shangri-la Singapore 22 Orange Grove Road, Singapore 258350, from 21 - 27 January 2019, 6pm - 10pm. p.+65 6213 4398. 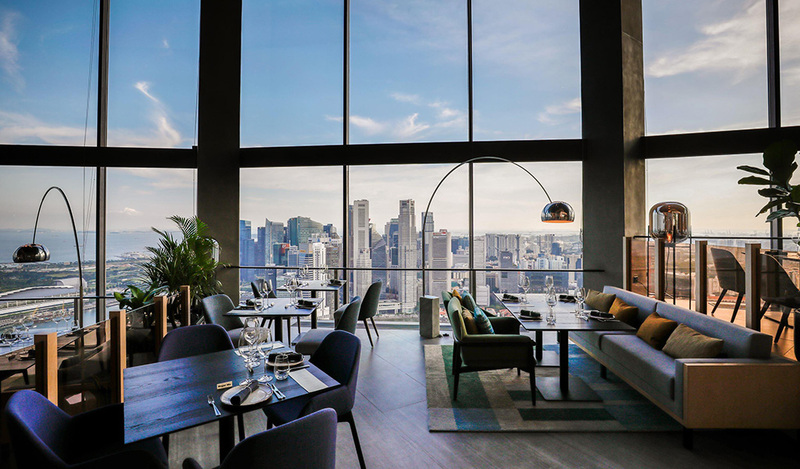 Head over to SKAI for a weekend brunch with a panoramic view of the Singapore cityscape. Priced at $118++ per person (with free flow houses wines) or $168++ per person inclusive of Taittinger Brut Reserve and cocktails, the a la carte buffet brunch features dishes like the mouth-watering Wagyu Beef Tataki with pickled eryngii and ponzu and the succulent Black Cod paired with potato and sweet corn. The cocktails are courtesy of Beverage Manager Rusty Cerven; be sure to try the fragrantly nutty Breakfast Bellini made with toasted oats infused vodka, honey, apricot, and champagne. SKAI is located at Level 70, Swissôtel The Stamford, Singapore 178882, p.+65 6837 3322. SKAI Brunch is served every Saturday 12pm - 3.30pm and Sunday 11.30am - 3.30pm.